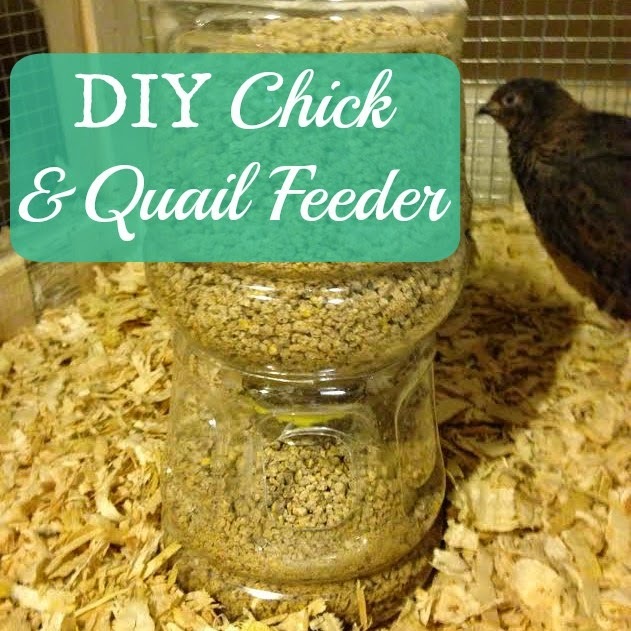 This is officially the easiest DIY feeder you can make! With just a few items, you can have a feeder finished in minutes. This feeder is perfect for baby chicks, fully grown quail, or a bird in isolation. We like using these for our coturnix quail, because they are compact feeders that fit perfectly into their cages, and really cut down on any food spillage and wasted feed. You need a few items to get started: a juice bottle, a pair of scissors or a knife, and a small amount of sandpaper. If you don't drink juice, ask a friend to save a bottle for you! Begin by removing any labels from your bottle, and thoroughly washing it. Next, cut your bottle in half. 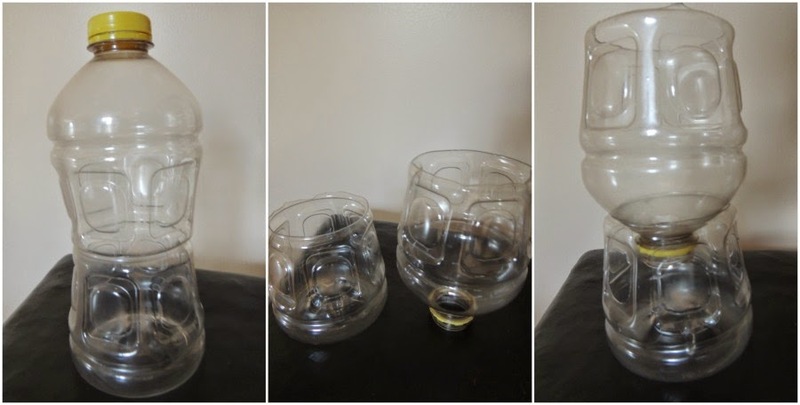 You want to be able to flip over the top of the bottle, and rest it inside of the bottom of the bottle. Depending on the dimensions of your particular bottle, you may need to experiment with where you make your cut. Using gravity, the bottom of the feeder will always have just the proper amount of feed. Next, cut three or four holes around the bottle. A lot of bottles have some circular grooves already in them, and they make convenient stencils! The holes must be big enough for the bird to access the feed, and low enough as well (if it's quail or chicks using the feeder). Once you are satisfied with the holes, smooth out any rough, pointy, or jagged edges in the plastic by using your sandpaper. That's it! Your feeder is ready to go. The weight of the feed in the top will hold it all together, and gravity will pull the feed down as needed. 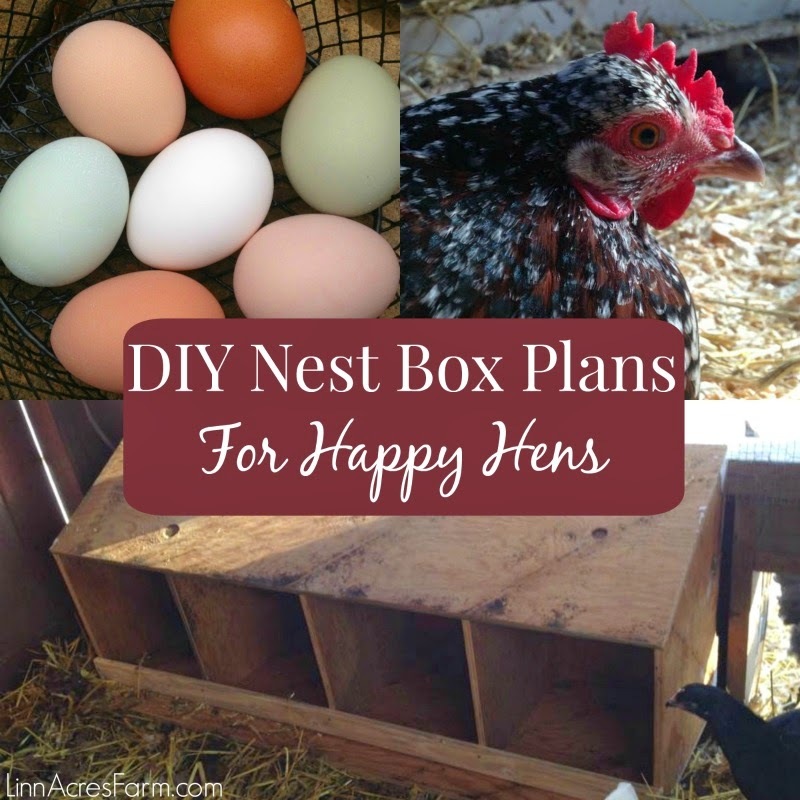 Do you use DIY feeders or waterers on your homestead? Share in the comments! I love this! So simple. 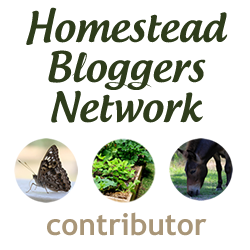 :) Thanks for sharing at the Homestead Blog Hop! Hope to see you again this week. Awesome! I was wondering how much feed the older full grown quail scoop out with their beaks? I have designed another similar method using a soda bottle that I would like to show you so you could possibly post for others...AND if you see another way of making it better, in effort to keep feed going in bellies and not the floor/droppings, that's all the better. I am all about helping others out...and always looking for ways to make life easier for myself and others.